This is a wonderful collection of favorite solitaire games. 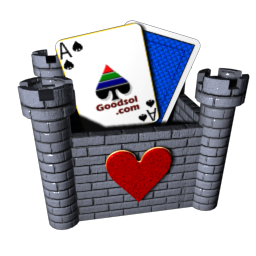 Goodsol Development has published Most Popular Solitaire 2.10, a maintenance update to this collection of the most popular solitaire games for both Mac OS X and Windows. Most Popular Solitaire contains 30 games, including the most common varieties such as Klondike (a.k.a., “Solitaire”), Spider, and FreeCell, as well as more unusual forms of patience such as Crazy Quilt. This version greatly improves the interface for selecting and organizing games. In Most Popular Solitaire, you can play a wide variety of different types of solitaire, giving a taste for various forms of gameplay and allowing you to decide (and mark) your favorites. Here is a quick sampling: Pyramid is very popular, involving removal of pairs of cards to reveal other cards and clear the layout; Forty Thieves is enormously popular, involving the proper selection of cards and use of tableau spaces; Aces Up (which I learned more than 40 years ago as “Idiot’s Delight”) involves eliminating lower card ranks until only the four Aces are left; Canfield is a historical game with some cards needing to be unburied from a reserve; Golf is based on removing cards by building up and down on the waste pile; La Belle Lucie is a favorite game of mine of the Fan variety; Cruel is an interesting form of solitaire made popular in the (original) Microsoft Entertainment Pack; Scorpion and Yukon are solitaire games where entire columns of cards are moved regardless of sequence. I have mentioned fewer than half of the games in this collection; there is truly something here that will appeal to everyone. Most Popular Solitaire is another one of the games based on our proprietary Goodsol Solitaire Engine; in fact, MPSol 1.0 was the original source for GSE, as well as the first version of Pretty Good Solitaire Mac Edition. It was originally introduced, more than 7 years ago, as an alternative product for those solitaire players who were a little overwhelmed by the hundreds of games in PGS (for Windows); however, my design and programming approach (and tools) were enough different from the flagship product that, while the deals are the same, the playing experience is certainly different.